Continuing with the celebration of the Fall of the Berlin Wall and a resulting quick review of the Romanian Revolution, the blog presents a Christmas present for all — the complete game file of the 1986 European Cup Final matching Romanian army club STEAUA BUCHAREST and Spanish La Liga side FC BARCELONA. Among the stars on display are influential all-arounder BERND SCHUSTER, the European champion in 1980 with West Germany equally adept at winning the ball with a tackle in defense as prompting the attack with a surgical ball or threatening run; FC Barcelona’s line-up also includes the fancy dribbling skills of Spain international winger FRANCISCO CARRASCO as well as the uncompromising, physical play of defensive midfielder VICTOR MUNOZ, who started all five of quarterfinalist Spain’s matches at the 1986 FIFA World Cup in Mexico. Speedy international winger MARIUS LACATUS, the eventual match-winner of the 1986 European Cup Final and a future World Cup hero for Romania, headlines the Startelf of Steau Bucharest. Also on hand for the army club in Seville are experienced and classy veteran midfielder LASZLO BOLONI, who collected an impressive 108 caps and 25 goals for the national team of Romania in his career, in addition to skillful Romania international sweeper MIODRAG BELODEDICI. 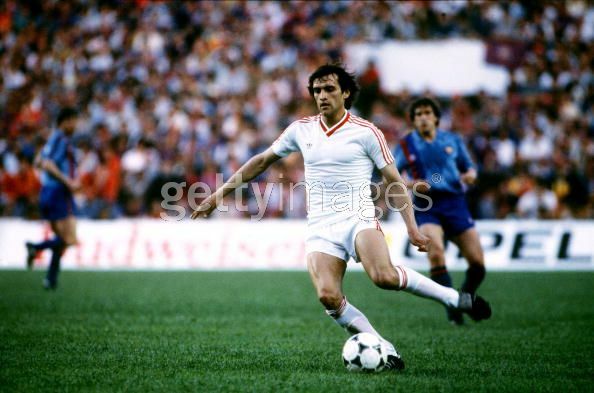 An ethnic Serb, Belodedici, later defected to Yugoslavia and became the first player to win the European Cup with two different clubs after success with Red Star Belgrade in 1991. Do YOU have the requisite courage to last not just for the scoreless 120 minutes, but the intestinal fortitude to survive a tense penalty kick shootout where the goals do not come cheap?